The end of league play in Ontario, a McMaster-Western battle for first place in the OUA, playoff positioning in all four conferences, players and coaches climbing up national record lists. Here are some things to keep an eye on during Week 9 of the U Sports football schedule. Noah Picton, quarterback, Regina: With 2,398 passing yards in six games and two contests remaining in conference play, the Regina native is on pace for a 3,199-yard season, which would surpass the U Sports record of 3,162 set last fall by former Calgary Dinos standout Andrew Buckley. Derek Wendel, quarterback, Ottawa: With 203 completions heading into the Gee-Gees’ final league game, the native of Belleville, Ont., needs 14 on Saturday to eclipse his own U Sports mark of 216 set a year ago. The U Sports career leader among active players in passing yards (8,526), touchdown passes (64), completions (617) and attempts (963), Wendel would also become the first quarterback in U Sports history to record a second 3,000-yard season if he throws for 401 or more against Queen’s. Mike Kashak, defensive end, McMaster: Going into the Marauders’ conference finale, the fifth-year senior from Courtice, Ont., has 11.5 quarterback sacks on the season and needs 1.5 more to break the U Sports record of 12.5 set in 2012 by former McMaster teammate Ben D’Aguilar and Montreal’s Jean-Samuel Blanc. Adam Preocanin, kicker, McMaster: With 24 field goals in the first seven league games of his university career, the freshman from Burlington, Ont., needs three on Saturday to shatter the single-season U Sports record of 26 shared by Guelph’s Daniel Ferraro (2014) and Calgary’s Johnny Mark (2015). Tunde Adeleke, punt returner, Carleton: With 703 punt return yards in seven games this fall and 1,919 since the start of his university career, the fourth-year senior from Ottawa could become on Saturday the third player in U Sports history to reach the 800-yard plateau in a single season and the sixth player to reach 2,000 for his career. The U Sports football record book is available ONLINE. Queen’s Pat Sheahan (149-104-1), in his 28th season as a U Sports head coach, and Laval’s Glen Constantin (149-29), in his 16th campaign at the helm, are both one win shy of the 150 mark overall (regular season & playoffs). Despite a disappointing loss to previously-winless Alberta last weekend, No. 8-ranked Regina would clinch a home playoff date for the first time since 2012 with a win over reigning Vanier Cup champion UBC. The Rams have already defeated the Thunderbirds once this season, prevailing 20-10 on Sept. 17 in Vancouver. Less than a year after they claimed their first national title since 1997, the T-Birds are fighting for their playoff lives and it won’t get any easier next week as they are set to wrap up the regular season against Canada West-leading Calgary. Without a doubt the game of the week across U Sports as first place in the OUA standings will be on the line at TD Stadium in London. Whoever wins on Saturday, it will extend to six consecutive years the streak of either Western (2011, 2013, 2015) or McMaster (2012, 2014) finishing first in Ontario. Depending on other results across the conference, the fifth-ranked Marauders would end up no lower than third with a loss, while No. 3 Western can finish no lower than fourth. The duel pits the nation’s top-scoring team (Western: 53.4 points per game) against the country’s stingiest defence (McMaster: 9.7). Fourth-ranked Calgary has already secured a post-season berth and can clinch first place in Canada West with a win over Saskatchewan combined to a Regina loss against UBC. 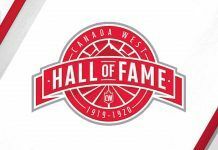 A pair of conference record streaks are on the line in the next two weeks: The Dinos string of eight consecutive seasons with a home playoff game is already the Canada West standard, while the Huskies’ current streak of 15 straight playoff appearances is the longest in conference history. In the first confrontation of the season between the two old rivals, on Sept. 16 in Saskatoon, the Dinos escaped with a 20-19 victory thanks to a Niko DiFonte field goal with 41 seconds left in regulation. According to 16 different scenarios across OUA this weekend, No. 6-ranked Carleton can finish as high as second and no lower than fourth in the conference standings. The Ravens are heavy favourites going into their league finale against a Waterloo team hoping to avoid its second straight 0-8 campaign. Carleton ranks fourth in the country in points per game (39.3) and fifth in total offence (517.9 yards per game), while the Warriors rank last in points allowed (56.0) and 26th in overall defence (599.4). Like Carleton, seventh-ranked Laurier can finish as high as second and no lower than fourth in the OUA standings. Windsor, on the other hand, will need a lot of help to extend its season past Saturday as the Lancers make the playoffs in only one of 16 OUA scenarios: A win over the Golden Hawks combined with victories by Western, Carleton, Ottawa and York. Despite the loss of standout running back Dillon Campbell at the end of last season, the Hawks are tied with Western for the top rushing offence in the nation this fall (284.9 yards per game). Win or lose Saturday in Kingston, No. 9-ranked Ottawa will take fifth place in the OUA standings. 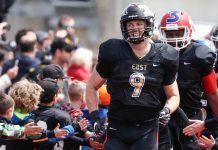 Queen’s would secure the sixth and final OUA playoff berth in 11 of 16 scenarios, and could even advance with a loss. The Gee-Gees’ second-ranked passing offence (392.7 yards per game) goes against the Gaels’ top-rated passing defence (165.4). With two conference games remaining, StFX has already clinched first place in the AUS standings, a first since 1997 for the X-Men. The reigning Atlantic champions are 5-0 against AUS opponents this fall and have already defeated Acadia twice this season, 37-8 on Sept. 17 and 42-21 on Oct. 7, both times on home turf in Antigonish, N.S. 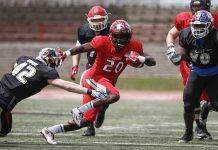 After suffering a heartbreaking loss to Mount Allison last week on a last-second blocked field goal, the Axemen are hoping to put an end to a five-game losing streak to keep pace with the Mounties (2-4) and Saint Mary’s (2-4) in the playoff race. While Laval (5-1) and Montreal (5-1) are once again dominating this season in the RSEQ conference, McGill, Concordia and Sherbrooke are in a dog fight for third place, with all three teams currently sitting at 3-3. The Redmen and Stingers met in their league opener back on Sept. 2, when Concordia took advantage of five McGill interceptions and three lost fumbles to prevail 30-16. The Redmen boast the top run defence in the country (65.0 yards per game) and, along with Montreal (266.8), are one of only two teams across U Sports to allow under 300 total yards per game (299.3). A win on Saturday combined to an Acadia loss against StFX would secure second place in the AUS standings for Saint Mary’s as the Huskies have already beaten Mount Allison twice this season, 32-27 on Sept. 16 and 29-21 two weeks ago. The Mounties rank last in the country in passing yards per game (156.0) and their struggles in that department were never more evident than in their most recent loss to Saint Mary’s, when they completed only nine of 21 passes for 35 yards. Coming off a stunning upset of Regina last Saturday, Alberta is looking to win back-to-back games for the first time since early last season, when the Golden Bears got off to a 2-0 start before dropping their next six contests. For Manitoba, it’s been an up-and-down campaign to say the least as the Bisons opened their league schedule with two straight losses, rebounded with back-to-back victories, before dropping their last two. While Alberta needs a win on Saturday and some help to make the playoffs, Manitoba could be eliminated with a loss to the Bears combined to wins by UBC (vs. Regina) and Saskatchewan (vs. Calgary). While Guelph and York are not mathematically eliminated from playoff contention, both teams would only extend their seasons in two of 16 OUA scenarios. It would be a disappointing finish to say the least for the Gryphons, who a year ago captured their first Yates Cup title since 1996. The Lions haven’t made the playoffs since 2004. With two games left in the regular season, top-ranked Laval needs to close a 10-point gap with Montreal in points allowed in order to finish first in the RSEQ standings, assuming both teams end up with identical records. For the Rouge et Or, the chase starts on Sunday against Bishop’s, a team they have defeated 20 straight times overall since forfeiting three wins over the Gaiters in 2001. Laval’s last on-field loss to Bishop’s dates back to Oct. 25, 1997 (17-14 in overtime). Sherbrooke has been a tough opponent for No. 2-ranked Montreal in recent years and it was the case again three weeks ago, when the Carabins stole a 27-20 win on the road thanks to a pair of touchdowns in the final seven minutes of regulation. Despite a 22-19 setback on home turf against Laval last Saturday, Montreal still boasts the best overall defence in the country (266.8 yards per game) and ranks third in points scored (42.2). In the first head-to-head contest of the campaign, the Vert & Or were able to generate 339 yards of offence, including 302 through the air.